Are you Looking for Complete CA Course Fees Details, then you have landed on the right blog because in this blog providing a complete detail about Total Chartered accountant course Fees in India like Registration fees, Journal membership fees, Exam fees, etc for CA Foundation Intermediate and Final course. Now we are going to tell you the latest and updated ICAI CA Course Fees structure for CA Foundation, Intermediate, and Final. CA Foundation is the first level in CA Course and at this level, students have to pay registration fees, Journal membership fees, and Exam fees. To register for CA Foundation Course students have to pay registration fees and Fees for registration is Rs 9000. ICAI has its own publishing house, who publish magazines for CA students and the Fees of journal membership is Rs 200. Journal membership is optional for CA students. After registration, students get 4 months of the study period and after this period students have to register themselves for the exam. Exam fee for CA Foundation is 1500. The late examination fee is 600. CA Foundation course validity is 3 years and students can revalidate the fees by paying revalidation fees. Revalidation fee for CA foundation is Rs 500. Students can register for CA intermediate course under two approaches, one is Foundation route and second is Direct entry route. CA Intermediate is the second level in CA course and CA Inter fee structure includes Registration fees, Exam fees, students activity fees, and ICITSS fees. For direct entry route students for both – Rs 15000. Fees for direct entry route students for both groups – Rs 2700. Journal membership fees for CA Intermediate is free of cost but direct entry route students have to Rs 200 for journal membership. Students activity fees for CA Inter is Rs 2000. ICITSS is 4 weeks of mandatory training for CA students and the fees for ICITSS for foundation route students and direct entry route students are Rs 13500. Fees for changing for from Old IPCC course to New Intermediate course is Rs 500. CA Final is the last level of the CA course. You can register yourself for final, after clearing both groups of CA Intermediate and after completing 3 years of practical training. After clearing this level you will be a member of ICAI. As we told you above after clearing both groups of CA Intermediate and after completing 3 years of practical training/ Articleship, you can register yourself for CA Final course. The registration fees for CA Intermediate both groups are Rs 22000. For both groups – Rs 3500. Students have to pay Rs 2000 for Articleship/ practical training registration. Students also have to pay Rs 500 for the assessment test. AICITSS training is divided into two group and students have to pay Rs 7000 and Rs 7500 respectively for AICITSS training. 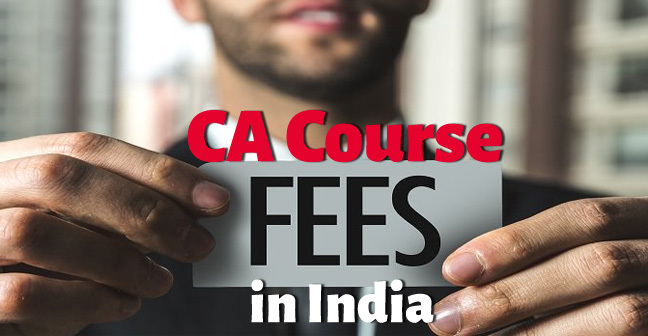 Now we have told you all the details regarding the CA Course Fees in India like total CA Foundation course fees, total CA Intermediate course fees and total fees for CA Final course. Hope you like this article. If you have any query related to Chartered accountant course fees please tell us in the comment box.